I flew back to NYC on Thursday and barely made it in. I had the last flight out of Buffalo before Jetblue cancelled everything due to the snow storm. I got home and was absolutely exhausted. I considered calling in sick to work the next day so I could sleep in but my darn work ethic got the better of me. I went to bed early and hoped for a quick and easy day. I woke up at about 5:00 am and looked out the window…There was snow! Not just a little snow- a LOT of snow!!! I grabbed my phone and brought it back to bed in hopes of some good news. Literally within minutes I got the news I was hoping for. Snow Day!! No work for me! I can’t even explain how happy and relieved I was! I jumped back into bed under my big fluffy comforter and went right back to sleep. A few hours later I woke up well rested and completely refreshed. I did a nice long stretch in my bed, kind of like a cat would do, and hopped out ready to play in the winter wonderland. 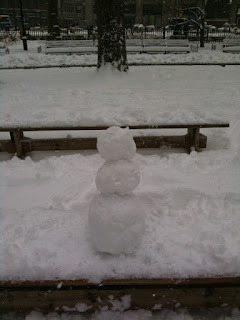 I threw on my heaviest winter coat, a warm hat and gloves, strapped on some boots and I was off! I walked around Times Square and through Rockefeller Center. I stopped at Maison du Chocolat for some treats and finally over to Midtown East to meet Mr. T on his lunch break. We decided to go over to BXL for lunch since it was fairly nearby. Mr. T doesn’t believe in snow gear and was wearing basically the same thing he wears in summer, except topped with a warmer coat. Needless to say his shoes and attire were not conducive to the winter storm raging around us. We grabbed a seat at the end of the long wooden bar and each ordered a tasty Belgian beer. 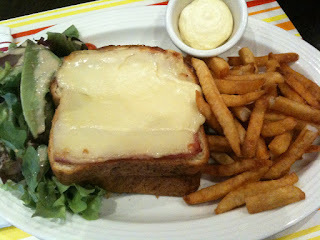 I was in the mood for a hearty sandwich and ended up ordering the same as Mr. T the Croque Monsieur. For around $11.95 this is a pretty big lunch deal for Midtown. A huge sandwich, side salad and a ton of fries. We easily could have shared this and been okay. Huge pieces of white fluffy bread were slathered with butter and layered with an insane amount of Gruyere Cheese and thin strips of ham. This sandwich is not for the weak of heart. The buttery bread and rich cheese probably clogged up an artery but it was damn tasty. The only funny thing was that in Mr. T’s sandwich his ham was in the middle, on my sandwich it was placed up top? Kind of weird. The lunch was so big both of us only got through about half of it and took the rest home as leftovers. I swore I wouldn’t be able to eat again the rest of the day I was so full. Then somehow I found myself in a BBQ joint late that night…. The Best Banana Cake ever!